Think about this: The purpose of any event – whether it's a 1500-person sales meeting or a 5-person training session – is to expand what the audience knows, does or believes. If an event can't accomplish this, it's probably not worth having. Yet, time after time, events are produced that have no lasting effect. Information is presented that doesn't resonate. The audience misses the relevance and remains disengaged. There's no call-to-action and so much data is dumped that the attendees can't distinguish the key takeaways. We approach events differently. We start with a deep understanding of how to emotionally engage an audience and deliver a message that is memorable and meaningful. It's more than creating an agenda. It's orchestrating an experience that engages the audience throughout the event. "Feedback from executives and attendees alike has been overwhelmingly positive… Congrats on two great sessions and for the memories that the audience has for a lifetime." "It was pleasure working with you and the team! We had a great time actually doing the presentation and I must say, over 100 ppl told us that we had the best presentation. You guys made us look like Rock Stars!" "You've certainly got a rock solid team... Our team will never forget the experience they had in Dallas!" Maybe you think your audience can EITHER be thoroughly entertained OR they can sit through a corporate presentation. But what if you could do both at the same time? Our goal is to keep you audience engaged in the message 100% of the time. Because once they tune out, your message falls flat. 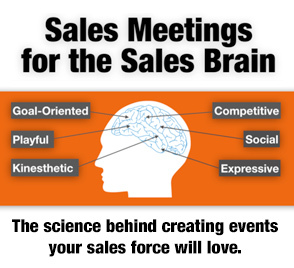 What persuades sales person X isn't going to work with HR person Y or even marketing executive Z. Each and every one of us is persuaded in a different way. We look at the different ways to persuade unique individuals, what's preventing them from accepting your message, and then we modify your communication to dramatically increase buy-in and commitment. There have been many studies designed to determine how people learn information. Guess what: It's not by sitting in a ballroom watching PowerPoints. But there are ways to create a true and intimate learning experience in a large group - even in an audience of thousands. We're experts in showing our clients how to present "it" so they get "it" and retain "it".